The Men’s Roller Derby World Cup has announced that the next edition of the global roller derby tournament for will take place in Calgary, Alberta, Canada, starting on July 14, 2016. The event will be hosted by Calgary’s own Chinook City Roller Derby. This means it will only be a two-year turnaround from the first Men’s World Cup held in Birmingham, England. Teams from 15 countries took part in the inaugural Cup, won by Team USA. The MRDWC expects as many as 20 countries to participate in the 2016 edition, including hosts Canada, who finished third place in 2014. The selection of Calgary also means that Canada will be the first country in the world to host two roller derby worldwide tournaments, with the first being the first-ever Blood & Thunder Women’s Roller Derby World Cup from Toronto, also won handily by Team USA. Later this week in Dallas, Texas, the second women’s World Cup will kick off with representation from 30 countries. Ticket sales for the men’s World Cup will open one year in advance on July 14, 2015. 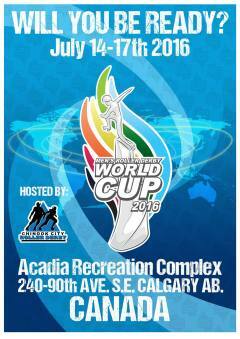 More information and announcements on the tournament can be found on the 2016 World Cup website.